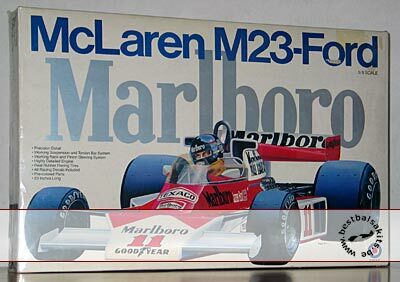 The holy grail of model kits for all James Hunt fans in huge 1/8 scale. Sheer impossible to find, this huge kit by Entex (same molds as original Edai Grip kit) in super 1/8th scale with lots & lots of room for super detailing. Box still very nice & strong. Parts new & complete, decals show age but brand new aftermarket set (our own ;-) is included in offer, so you're safe there. And as a bonus, you will receive the 1/8 alu turned air intake set we developed specially to add ultimate realism to this iconic car.